The Pantone 2017 color of the year is named Greenery. Each year I'm surprised by the color announced, and it's always an inspirational moment that makes me think. I instinctively caught myself thinking about new life, growth, spirituality, and hope when I saw Greenery. After reading this quote by Leatrice Eiseman, Executive Director of the Pantone Color Institute, my own personal thoughts started to make sense. "Greenery bursts forth in 2017 to provide us with the reassurance we yearn for amid a tumultuous social and political environment. Satisfying our growing desire to rejuvenate and revitalize, Greenery symbolizes the reconnection we seek with nature, one another and a large purpose." It truly is an exciting new year for a lot of reasons. One of many reasons is in regard to the portrayal Channing and I strive to build for our company. We are hitting hard on the term 'lifestyle'. We want to create luxurious lifestyles for our clients. By this we mean designing every last detail down to the embroidered table linens used for your dinner parties. We want our clients to sit back, relax, and watch their dreams unfold as we design and style every last nook and cranny of their home. That's our niche, and we're stickin' to it! In leu with the terms 'luxury' and 'lifestyle', and in honor of the Pantone Color of the Year, Greenery, we wanted to share some fabulous pieces that can be a real show stopper in your home this year! 1. 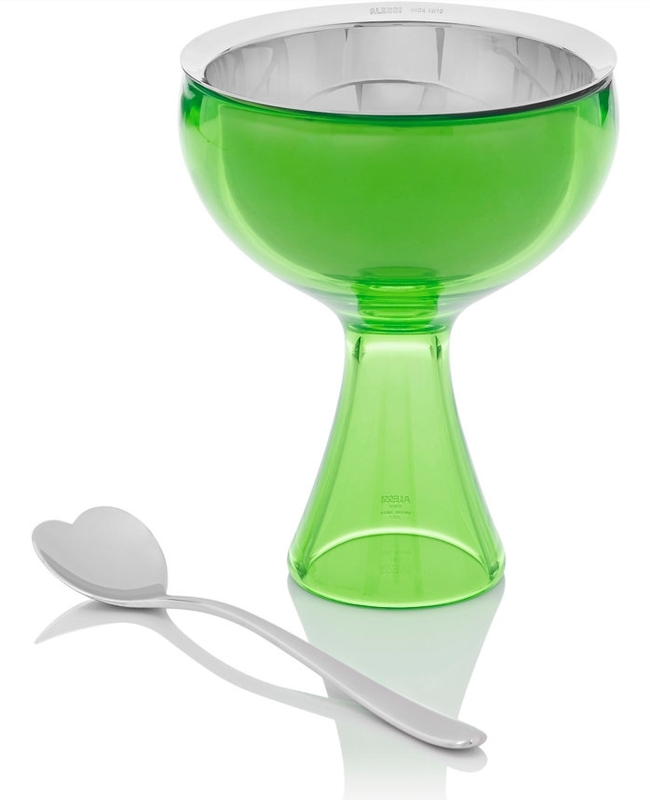 Okay I'm sorry, but how can you not adore this ice cream bowl and spoon by Alessi? This is such a darling piece that even comes with a heart shaped spoon. A beautiful scoop of strawberry sorbet would look ravishing in this bowl! 3. Christopher Farr's textile line named "Cloth" is one of our recent obsessions. Picture this vibrant, tropical print on an antique settee in the sun room of a Hampton beach house. Absolutely stunning. 4. A great cotton area rug can really brighten up a drab room. Madeline Weinrib is one of our go-to's for gorgeous, unique carpets. 5. In need of a funky accent chair for the ends of your dining room table or for that empty corner in your bedroom? Herman Miller's got you covered! Make 2017 fun and full of Greenery!